Ladies in gentlemen, it's time for Adventures in Ampersand Aquabord! I recently stumbled upon this amazing painting surface at my local art store and decided I wanted to give it a try. I love watercolors but hate stretching paper so I may have found the prefect solution! Aquaboard is available in lots of sizes and it's an acid free surface that is perfect for use with Water based media like watercolors and gouache. It is similar to cold pressed watercolor paper but there are some differences. The colors on the Aquaboard will appear much more vibrant than on paper because the paint will not absorb into the surface like it does on the paper. Aquaboard will not tear, warp or buckle like paper can. It is also much easier to lay colors one on top of the other. It is also much easier to lift color off the aquaboard surface exposing the surface underneath. The surface of the board can also be scrubbed without risk of damage to the surface. Lastly, the final painting can be framed without using glass. With that said I decided to give it a try and experiment with some different techniques! Step 1: The packaging looks like this and is ready to paint on right out of the packaging. So get out your watercolors and get ready! Step 2: The board seems to accept pencil very well and erase rather easily. However the surface has quite a bit of tooth and texture so you will not get smooth line work. Step 3: Experimenting with Acrylic Waterproof ink. The ink went on smoothly and easily and did not absorb into the surface. I was happy with the results of the ink. Step 4: Time for some color! I did notice some differences between the Aquaboard and cold press watercolor paper. The board takes a little longer to absorb the pigment so you might need a little more patience. Blow drying might speed it up, but I didn't try that. I let the initial paint layers absorb and then added the subsequent layers. Finally for a little more pop and intensity I added some acrylic paint to the piece. It also worked really well with the Aquaboard. It didn't bleed like I thought it might and I was pleased with how it turned out. The finished piece! Conclusion: Quite liked using the Aquaboard. PROS: Fantastic alternative to watercolor paper. Bright vivid color and easy to work with. CONS: Slow to absorb. Rough texture not good for line work and drawing. Had a fantastic time at the Eggplant Festival in Loomis CA a couple weekends ago! In honor of the Eggplant I created a special painting just for the show! Hope to come back next year! 1- When and where were you born? I was born in Sacramento, California on November 25th 1984. 2- When did you start getting into art? I like to say that I started drawing as soon as I could hold a crayon. I was always enthralled with the idea that I could make something out of nothing. My parents are both in finance but they are both very creative people who were always coming up with innovative ways of keeping my younger sister and I entertained. My dad would bring home big rolls of butcher paper which I would roll out on the kitchen floor and make elaborate murals for hours on end. 3- What made you realize that art was something you enjoy? When I was little I loved a series of books called, "Serendipity" books. They had wonderful illustrations by Robin James, who is still one of my role models and inspirations. I collected the books and began writing and illustrating my own homemade books at about 5 years old. Around that age I decided I wanted to be a professional artist some day. 4- Any family members, friends or acquaintances that influence your introduction to art? Not really. I actually don't have any close family members who are artists but my mother loves sewing, gardening and other creative outlets. 5- Any teachers or art classes in your past? Give me your history with art. Art was always my favorite subject- even in elementary school. In middle school and high school I took every art elective I could. As early as 8th or 9th grade I knew I eventually wanted to attend the Academy of Art University in San Francisco. After I graduated from high school in 2003 I attended a junior college for two years before attending the Academy of Art University in 2005. In 2009 I graduated with fine art degree in Traditional Illustration. 6- Favourite style of art? (Paint, draw, etc…) (Girls, magna style, big eyes, …) (Favorite colors to use) [State away!] 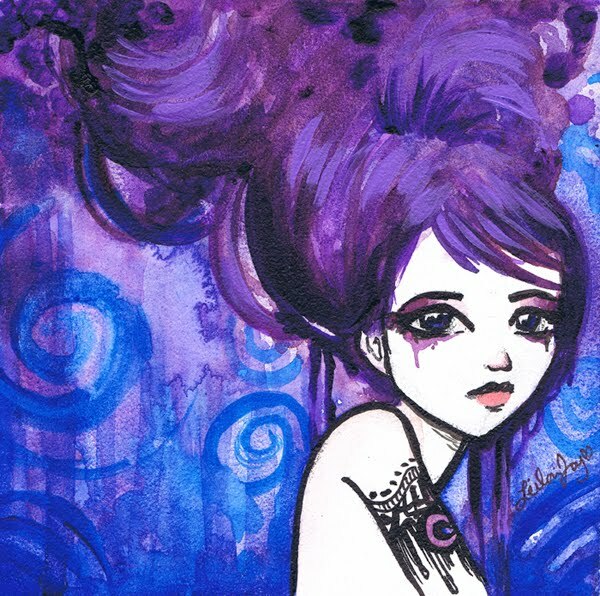 I love many styles of art, but primarily I love to draw and paint. I also enjoy using collage and unique materials. I also love making things like costumes! I love bright colors and most of my work reflects that. I love to mix an anime style with fashion illustration. 7- What are your biggest influences? My influences come from a variety of styles, but I'd say I'm most heavily influenced by art nouveau, manga, anime, pin up girls, tattoos, gothic art, and fashion illustration. 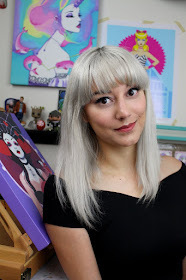 Some of my favorite artists are, Camilla d'Errico, Audrey Kawasaki, Erte, Alphonse Mucha, Marilyn Minter, David Downton, Laura Laine, and Stina Persson. 8- How are you inspired to create? [Your pieces, do you just see it in your mind and sketch it or do you plan it out or slowly get influenced?] (Basically how are you inspired.) My inspirations don't always come the same way. Sometimes it just pops into my head and I see something I want to create. Other times I do have to work at it a little more- I'll do research and several different sketches before starting the final piece. I find inspiration in a lot of different places- sometimes from a real person or I'll do my interpretation of a pre-existing character. I'm often influenced by movies, music and other art. 9- Any friends you do collaborations with? Who are your biggest supporters? (Mom, dad, friend, sister, brother?) 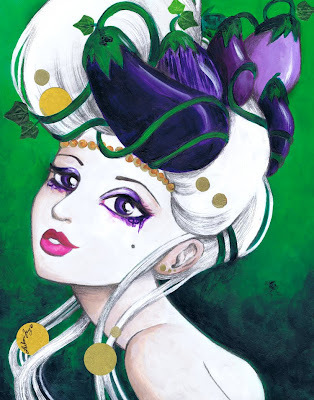 Recently (last week actually) I entered a Coloring Collaboration contest hosted by one of my artistic idols, Camilla d'Errico and I ended up winning 1st place which was extremely exciting for me. 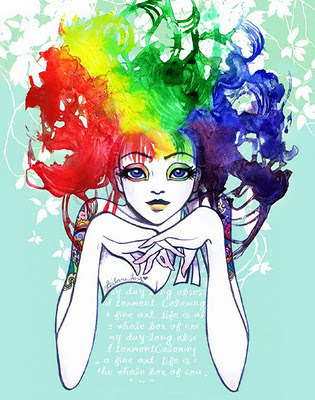 You can see my winning collaboration piece here on her blog: Coloring Contest Winners Announced / Camilla D'errico Blog I have tons of support from family and friends. I could not do any of the things I do without them. My parents, sister and my boyfriend (who is also an artist) support me in every way possible. I am very thankful for them. 10- Any obstacles in pursuing your art? (Do you do it as just a hobby? Or as a full-time job?) (In your past has anyone-parents, friends, family, society- ever try to put you down in pursuing this area?) I think most artists find that being in the creative field is not easy. Art has been my hobby my entire life, and only recently has it become my full time career. I recently quit my 9 to 5 secretary job to pursue art full time. I do have family members who still think of all artists as "starving" and burning their paintings for warmth. But in this day and age this is absolutely not the case. 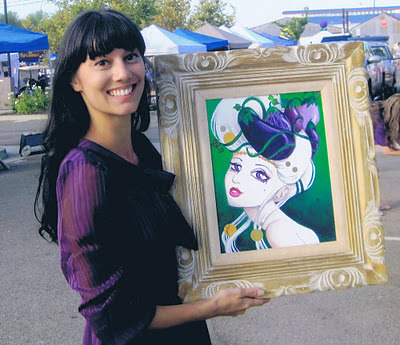 There are tons of opportunities for artists- almost everything you see around you had someone design or illustrate it. To be a professional artist it takes way more than talent. It takes tenacity, determination and passion. Even though there are times when I feel unsure about my career, I try to remember that I love it more than anything and if I keep working as hard as I can I will find success and happiness too. 11- Plans for the future? Where do you see yourself in ten years? To be honest I haven't planned that far ahead, but I hope to be living comfortably and supporting myself as an artist. I would like to have a strong portfolio and client list by that time and hopefully still doing what I love. 12- Send me a picture or a link to your favorite pieces and an explanation of the story behind it. This piece is probably my favorite piece. 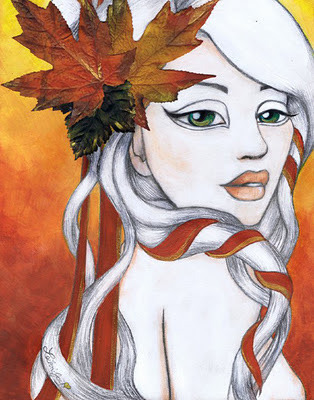 She is entitled, "Spectra" and I actually had a dream about her. I dreamed that I saw a girl with huge rainbow hair riding a horse and the hair was blowing wildly. I woke up and I just had to create her. I love the piece because it has a quite thoughtfulness while also being extremely loud. Something about her just always makes me smile. This piece is entitled, "October." It was inspired by the fall and all the colors of changing leaves. I love the mood of this piece and texture of the leaves that I collaged onto it. It has a peacefulness yet she is also coy and sensual. Definitely one of my favorite paintings. 13- Most importantly: What does your artwork mean to you? My art is like sharing a little bit of myself with everyone else. It's very intimate and personal. I've had people sometimes tell me that they see me in my work- and I agree with them because they are me. All different aspects of myself. Art has been my way to express every emotion from happiness to sadness to frustration and anger. When I can get to that place where I completely lose myself in a painting- it's the best feeling there is. 14- Last but not least: What advice do you give to young aspiring artists? Or do you still consider yourself one? If so, what would you have done differently in you past? I definitely still think of myself as an aspiring artist, but at the same time I've always been one. My best advise is to- just keep at it and follow the advice of the famous Andy Warhol: "Don’t think about making art, just get it done. Let everyone else decide whether it’s good or bad, whether they love it or hate it. While they’re deciding, make even more art." I try not to think about the past, and "what I could have done differently." The past is past. All I can do is strive to improve myself and my craft in the future.